A Short History of Nearly Everything | Flash Boys (Wall Street Revolt) | The Undoing Project: A Friendship that Changed Our Minds | Astrophysics for People in a Hurry | The Big Short | Moneyball | Home Game | The New New Thing | Panic! Amazon.com description: Product Description: From the #1 New York Times bestselling author of The Big Short, LiarÃ¢ÂÂs Poker and The Blind Side! The Greeks wanted to turn their country into a piÃÂ±ata stuffed with cash and allow as many citizens as possible to take a whack at it. The Germans wanted to be even more German; the Irish wanted to stop being Irish. The trademark of Michael LewisÃ¢ÂÂs bestsellers is to tell an important and complex story through characters so outsized and outrageously weird that youÃ¢ÂÂd think they have to be invented. (YouÃ¢ÂÂd be wrong.) In Boomerang, we meet a brilliant monk who has figured out how to game Greek capitalism to save his failing monastery; a cod fisherman who, with three daysÃ¢ÂÂ training, becomes a currency trader for an Icelandic bank; and an Irish real estate developer so outraged by the collapse of his business that he drives across the country to attack the Irish Parliament with his earth-moving equipment. LewisÃ¢ÂÂs investigation of bubbles beyond our shores is so brilliantly, sadly hilarious that it leads the American listener to a comfortable complacency: Oh, those foolish foreigners. 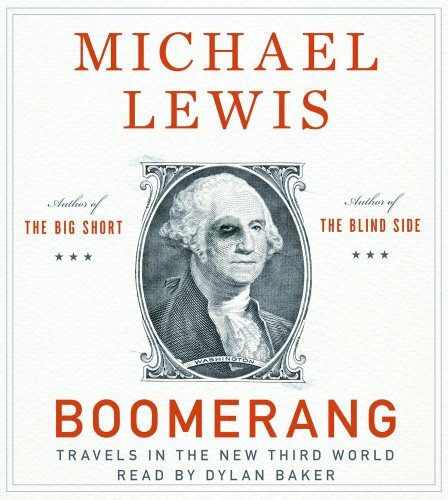 But when Lewis turns a merciless eye on California and Washington DC, we see that the narrative is a trap baited with humor, and we understand the reckoning that awaits the greatest and greediest of debtor nations.